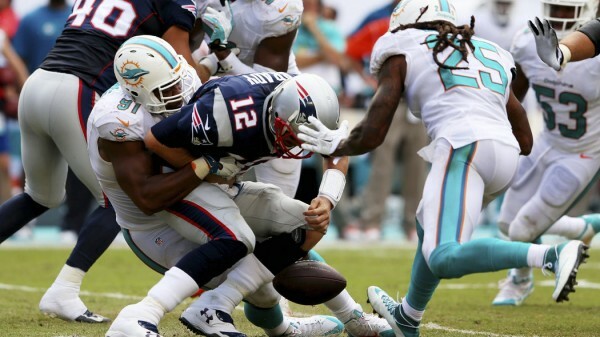 There’s nothing new about the New England Patriots losing on the road to the Miami Dolphins, but it’s rare to see it happening this way, with Tom Brady looking so helpless for the entire second half while Ryan Tannehill stepped it up to lead his team from behind towards a 33-20 opening day victory. The Patriots lost the first game of the season for the first time since 2003. They don’t hold at least a share of the lead in the AFC East for the first time since early 2012. All other three AFC East teams won, which makes things even weirder. They also gave up 23 unanswered points in the second half. They haven’t been outscored this badly by a team in the second half of a game since playing against the Steelers in 2008. Tom Brady wasn’t intercepted, but he completed just 29-of-56 passes, one pass going for a touchdown. He was sacked four times, and was hit or sacked on 35% of his dropbacks compared to just 21% last season, which raises another eyebrow as to why would Bill Belichik trade Logan Mankins just before the season began. Brady looked especially bad in the second half, but overall was just 2-of-18 for passes more than 15 yards downfield, over or under throwing the pass on 11 of those attempts. He was also just 4-of-12 when throwing to Rob Gronkowski (one pass for a touchdown), tied for the second-lowest completion percentage targeting the tight end in his career. But this wasn’t just about Brady. 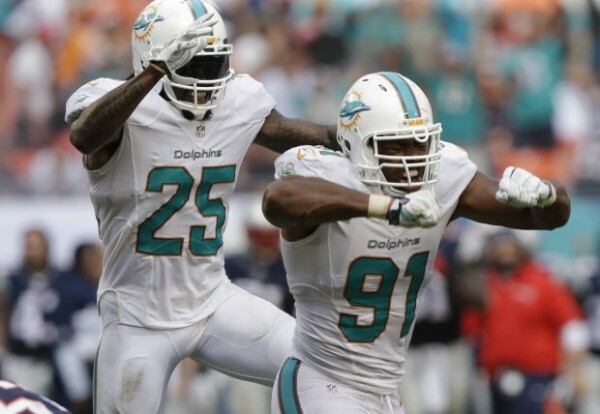 The Dolphins stopped making mistakes in the second half, and blew up on offense. Knowshown Moreno finished the game with 134 yards on 24 carries without any of those runs being for more than 15 yards. He simply found space, usually up the middle, and made the most of it time after time. Ryan Tannehill did throw an interception, but he also threw two touchdown passes – one to Lamar Miller on their first drive and another to Mike Wallace in the second half, a completion that tied the game at 20 in the third quarter. The Dolphins outgained the Patriots 227-67 in the second half, and 37 of those yards for the Pats came from a meaningless drive at the end of the game. Both teams combined for five turnovers, with Brady being the worse as he fumbled the ball twice as he struggled getting himself out of traffic or finding open receivers quickly enough during the second half. As he himself said – Nobody was open, they were covering everyone. The big question after the first loss early in the season always has to do about whether this was a core dysfunction of the team or perhaps it was simply a matter of poor execution and getting caught up in all the negative momentum? A similar question goes to the Dolphins, tired of being a 7-9 or 8-8 team, hoping that the second was the “real” them, showing that they’ve made another progress in all areas of the field under Joe Philbin, and ready to change the reality in the most one-sided division in the NFL over the last decade.